Grace Houghton married (?) McDonald. (?) McDonald married Grace Houghton. John Carl Houghton married Janice Marie (?) in Oct 2, 1965. Ronald Harry Houghton married Patricia Southgate in Jul 15, 1955 at Grand Rapids, MN, USA. Helen Aho married Harry Henry Houghton. Charles A. Carmel married Candice L. Houghton in Nov 1, 1975 at Monterey Co., CA, USA. Candice L. Houghton married Charles A. Carmel in Nov 1, 1975 at Monterey Co., CA, USA. Joseph J. Chicarelli married Carol L. Houghton in Sep 5, 1970 at San Bernardino Co., CA, USA. 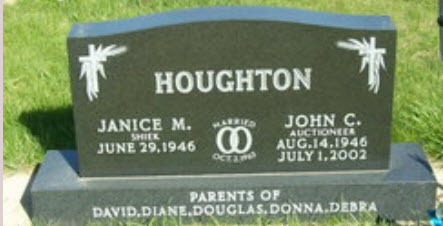 Carol L. Houghton married Joseph J. Chicarelli in Sep 5, 1970 at San Bernardino Co., CA, USA. Michael W. Howard married Carol R. Houghton in Dec 19, 1970 at Santa Clara Co., CA, USA. Carol R. Houghton married Michael W. Howard in Dec 19, 1970 at Santa Clara Co., CA, USA. Charles R. Shaw married Carol Rose Houghton, daughter of Donald Edward Houghton and Rose Mangan, in Aug 13, 1966 at Los Angeles Co., CA, USA. Harry J. Waterson married Carolyn W. Houghton in Aug 17, 1976 at Los Angeles Co., CA, USA. Carolyn W. Houghton married Harry J. Waterson in Aug 17, 1976 at Los Angeles Co., CA, USA. Robert A. Poirier married Catherin D. Houghton in Aug 23, 1971 at Los Angeles Co., CA, USA. Catherin D. Houghton married Robert A. Poirier in Aug 23, 1971 at Los Angeles Co., CA, USA. Stanley G. Harper married Catherin E. Houghton in Nov 1, 1962 at Los Angeles Co., CA, USA. Catherin E. Houghton married Stanley G. Harper in Nov 1, 1962 at Los Angeles Co., CA, USA. Carl M. Clark married Cathy J. Houghton in Mar 22, 1975 at Orange Co., CA, USA. Cathy J. Houghton married Carl M. Clark in Mar 22, 1975 at Orange Co., CA, USA. Ernest P. Ledbetter married Charlene A. Houghton in Mar 20, 1983 at Fresno Co., CA, USA. Charlene A. Houghton married Ernest P. Ledbetter in Mar 20, 1983 at Fresno Co., CA, USA. Charles L. Houghton married Caroline Gutierrez in Jul 15, 1972 at Los Angeles Co., CA, USA. Charles L. Houghton married Marilyn R. Perkins in Apr 8, 1961 at San Diego Co., CA, USA. Charles T. Houghton married Charlesa C. Lejeune in Jul 13, 1974 at Kern Co., CA, USA. Galen C. Berry married Charyll Houghton in Jun 11, 1976 at Ventura Co., CA, USA. Charyll Houghton married Galen C. Berry in Jun 11, 1976 at Ventura Co., CA, USA.